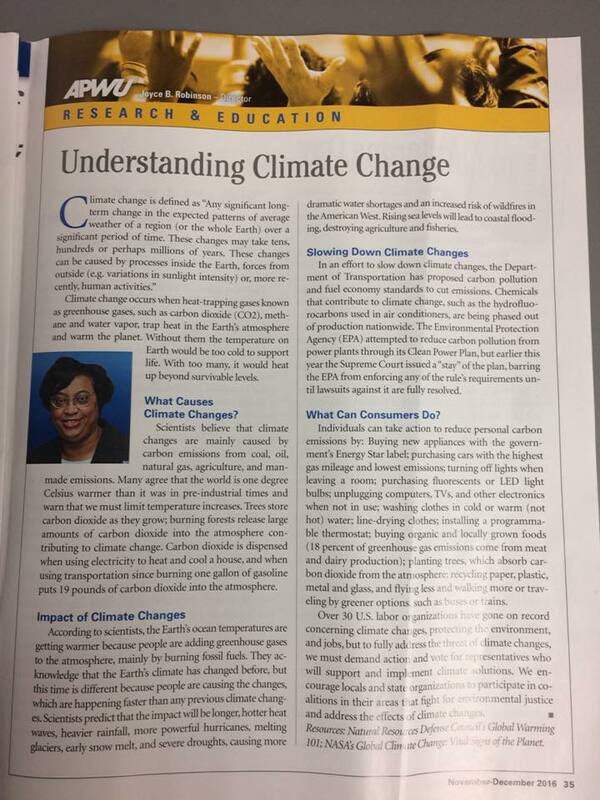 Dear APWU sisters and brothers, it has recently come to my attention that several months ago there was quite a buzz on the 21st Century Face Book page concerning an article that I wrote in the November/December issued of APWU’s magazine on Understanding Climate Control. There were comments made stating that the article was not relevant or appropriate for my department to address, etc. I just wanted each of you to know that both the Research and Education Department and the Communication Department were mandated by a resolution passed by the delegates attending the national convention in Orlando, Florida to educate the membership on this subject. For your information, the resolution is attached. Incidentally, my next article is on Developing a Fire Escape Plan for Your Home; I hope each of you find the subject relevant, as one of our local presidents recently died in a home fire. Wishing each of you a fantastic new year! This entry was posted in General Union Business and tagged APWU Director of Research and Education, climate change, convention resolution mandate, Joyce B. Robinson. Bookmark the permalink. You did not need to explain anything. Response was straight up politically driven anyway followed by a lame cut and paste. While I do not agree with your analysis of global warming, your comments were very insightful and were an intelligent review of the facts surrounding the issue. 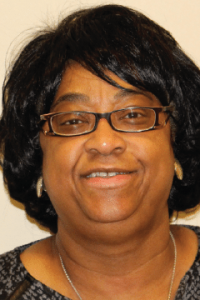 Thank you Sister Robinson for clarifying you were fulfilling the duty of your office to prosecute Resolution FR-5 when you published the “Understanding Climate Change” article in the November-December 2016 edition of The American Postal Worker APWU magazine. Man-made Global Warming/Climate Change is a very divisive issue. Those who believe and those who disbelieve in it do so with religious fervor. There is no objective middle ground. And no room for compromise on the issue is possible because most are either firmly in one camp or the other and no amount of debate is going to change anyone’s mind at this point. Arguing over this issue and/or trying to cram one camp’s belief’s on the other is only going to divide us and cause some Members to quit our Union in disgust of what they perceive is an attempt at dubious politics. The irony is that we all want clean air, clean water and clean land and we all would prefer clean sustainable Green Energy over toxic petroleum based fuels we fight wars over today. We don’t need the threat of Global Warming/Climate Change scare tactics to force us to make the right choices any more than we need the threat of eternal damnation to force us to treat each other with dignity, respect, love, tolerance, and forgiveness. In fact, threats tend to have the opposite effect and can be powerful motivators of resistance. Rather than pass resolutions that threaten our Membership with fiery “Hell on Earth” consequences if C02 levels rise above the 0.4% (400 parts per million) in our atmosphere today, just state what changes we are resolving to make such as convert USPS vehicles to some cleaner fuel type and/or add solar based heating and power generation to our facilities. That much we can all agree would be beneficial in terms of decreasing pollution and increasing sustainability of our environment and our jobs. There are far more Global Warming/Climate Change American skeptics than you realize who are fully aware of the science that shows C02 levels peaked in the Cambrian period at around 7% of the atmospheric total (7,000 ppm), some half a billion years ago. That’s more than 17 times more C02 than the 0.4% we have now. I’m not saying they are correct in their conclusions, but the extremely elevated Cambrian C02 levels in turn did make the majority of this planet a lush tropical rain forest with plant life (food) growing many times lusher and faster than it does today. This in turn established the only type of ecosystem that could support ginormous dinosaurs and create a layer of decaying plant life so thick that it became the coal and oil fields we are exploiting for fuel today. The real Global Warming/Climate Change concern we should all be afraid of is that all changed in a single day when an ELE (extinction level event) asteroid struck our planet. Which of course as we all know wasn’t the first or last ELE to strike our earth. Again, my point is to stop dividing us and diverting our attention, time and effort into fighting each other with endless debate and argument over controversial issues that are unnecessary in making our case for actual achievable goals that are already supported by other convincing factors we can all agree upon. Tacking Global Warming/Climate Change scare tactics on to Resolution FR-5, which could have easily been supported with other solid arguments, is nothing more than dubious politics. And dubious politics are why we will not be inaugurating Bernie Sanders as our next President.